Imagine a workday where you fly through your to-do list. You feel calm, focused, and accomplished. No interruptions. No “quick questions” that derail your schedule. No getting sidetracked by emails, Slack messages, or document sharing app notifications. For most people, that’s far from reality. Instead, context switching has taken control of our workdays. Distracting us and making us more error-prone at work, context switching happens when we’re forced to move from one tool, software, or messaging app to another before completing a task. To take a closer look at how context switching is impacting our mood and ability to get work done, we surveyed 2,000 workers across the US. Overwhelmingly, people reported that context switching is causing us a great deal of stress. Here’s why, and how by cracking down on context switching, we can stress less and accomplish more. 1. We’re getting more messages than ever. 68 percent of people said the number of emails they’ve sent and received has risen over the last 3 years. With our old standards like shoulder tapping and email, plus newer communication tools like Slack and Workplace by Facebook, we’ve got more ways to reach teammates than ever before. That means the number of messages we receive each day has grown, too. 2. Messages aren’t always productive. 34 percent people said they use chat tools primarily for non-urgent or non-work-related communications. Often times, live chat tools are the go-to place for casual or less formal questions like, “What’s for lunch?” and “Where’s that screenshot from yesterday’s presentation?” — things that are seemingly small, but can easily whip you out of focus. 3. More messages bring more interruptions. A third of people said their work is interrupted 10 or more times each day. Teams are working more collaboratively than ever today, so communicating with your team is critical. But are all these messages necessary for us to get work done, or are they holding us back? Probably the latter. 4. Constant interruptions are stressing us out. Two-thirds of people said all the work-related notifications they get via email, text, push, and chat make their job stressful. Stress at work is increasing, year after year, and getting notifications from all our different communication tools certainly isn’t helping. For Millennials and remote workers, those numbers were slightly higher, at 70 and 72 percent respectively. 5. Not surprisingly, when email piles up, stress does too. 70 percent of people who reported that their work is very stressful have seen the amount of email increase in the past year. 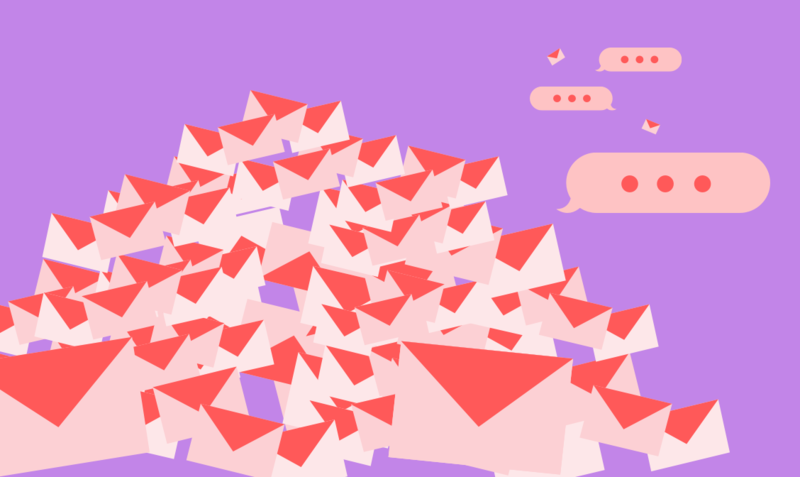 When your inbox is clogged, it makes sense that you’ll feel more stressed. And the more tools we pile onto the equation, the more stressed we feel: 40 percent of those who have seen email increase dramatically in the last year said that real-time communications, like chat apps, make them more stressed at work. 6. The stress is taking a toll on our happiness. 70 percent of those who said work is stressful strongly agreed that constant interruptions make us less happy. Sure, interruptions make it tough to get work done, but the impact hits harder than that. Of the respondents who reported having the highest stress levels, 84 percent agreed that the constant interruptions they experience at work are bringing down their happiness. Instead of working reactively, at the mercy of pings, virtual shoulder-taps, and a vast internet of distractions, crack down on context switching to take control of your workday. Need a little help getting started? Download this worksheet to see how many times you switch contexts during the day, and where you stack up against the average worker in the US. Research methodology: This survey was conducted on Front’s behalf by Market Cube from August 6 - 14, 2018. Respondents were 2,000 adults in the US that have a work email address and work with one or more colleagues on a regular basis.